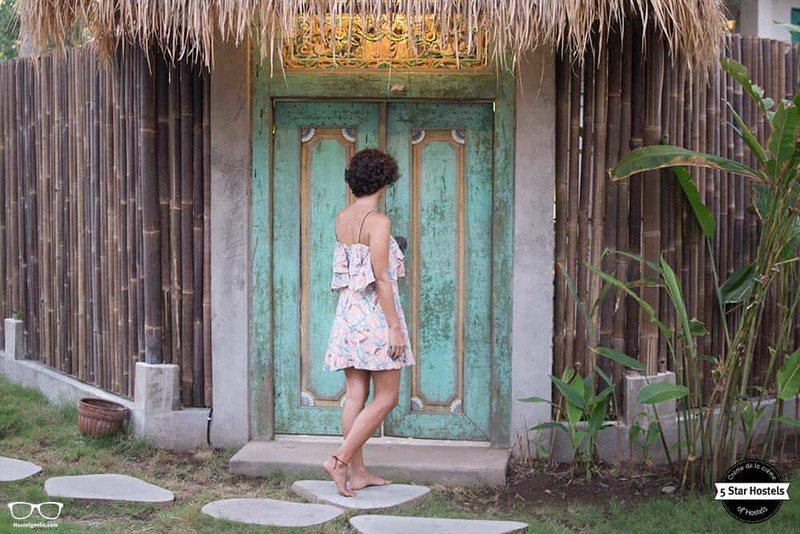 Soak up the sun, refresh in the private swimming pool or hide under a palm tree at Captain Coconuts Gili Air, the brand new 5 Star Hostel in Gili Air. A tropical resort on a paradise tiny island in Indonesia. 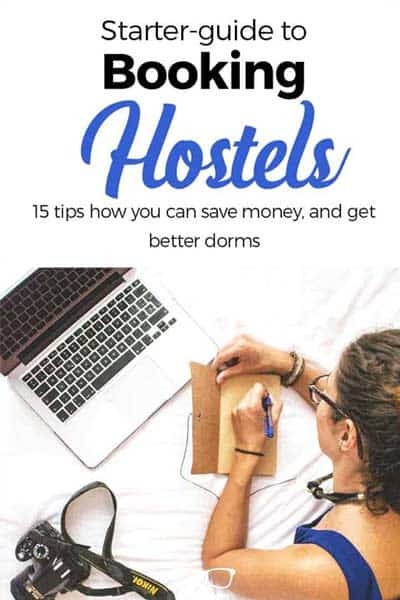 We visited and reviewed the hostel-resort for you. 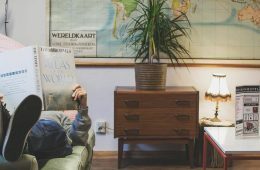 We brought back one of the best hostels in the world and a review of your next dream destination. How to book Captain Coconuts Gili Air? 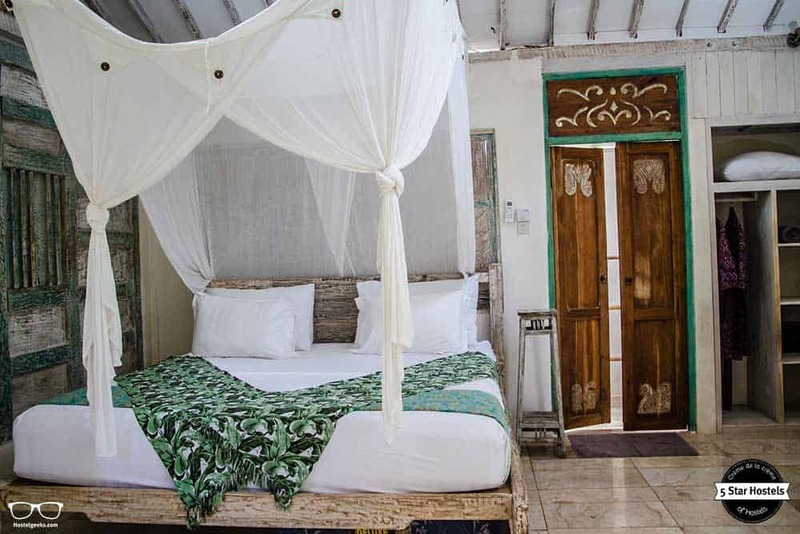 You just found our #1 recommendation for best hostels in Gili Air, Indonesia. Genuinely, Captain Coconuts Gili Air is the accommodation we recommend to our friends, family, and to you! You will like it! 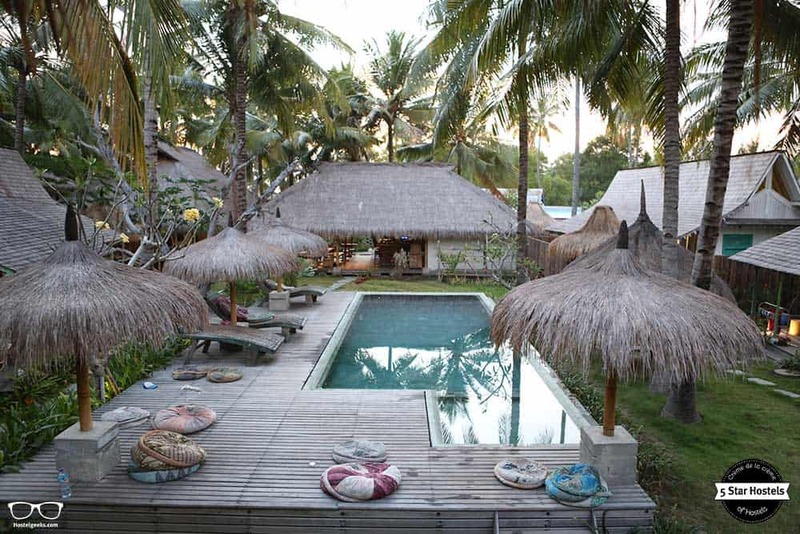 Planning to stay at Captain Coconuts Gili Air? Please use the links provided above. Captain Coconuts is located on Gili Air, one of 3 Gili Island in North Lombok, NTB, Indonesia. The island itself is just 5km in Diameter with reef passes protecting is white sandy beaches. Captain Coconuts Gili Air is located on the south west side of the island, famous for its beautiful sunset. It is nestled in the coconut grove 100 meters from the popular sunset beach bars. You can get to Gili Air from Bali or Lombok. Find all details on how to get to Gili Islands below. Once your in Gili Air, you can find Captain Coconuts by heading West. From Gili Air Harbour, go along the beach path until you reach Gili Lumbung (look for the famous swing in the water), turn right to the laneway and 20 breaths away you’re where you need to be. Captain Coconuts Gili Air is located on the tiny island Gili Air, Lombok in Indonesia. Gili Islands are beautiful tropical islands with clear water near the famous Bali, in Indonesia. But, it actually belongs to Lombok, the neighboring island of Bali. 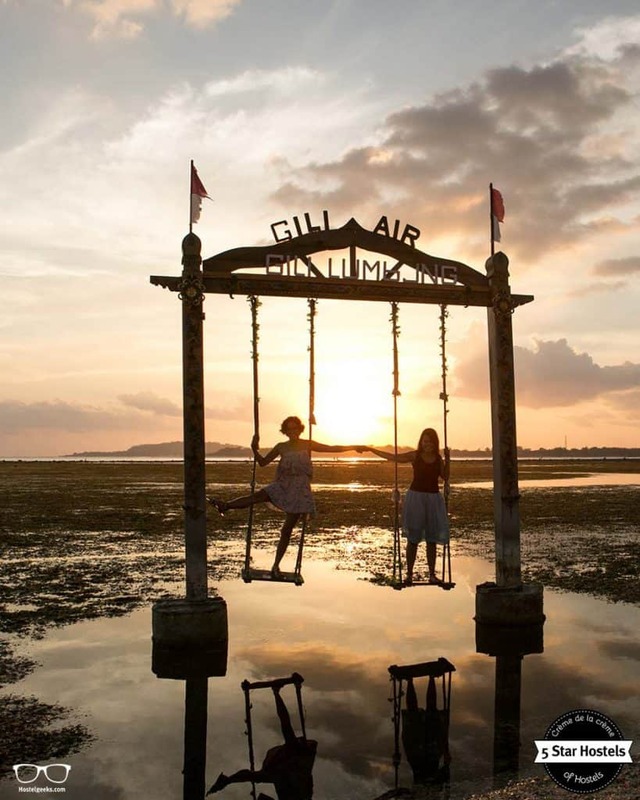 There are plenty of activities to do on Gili Air. 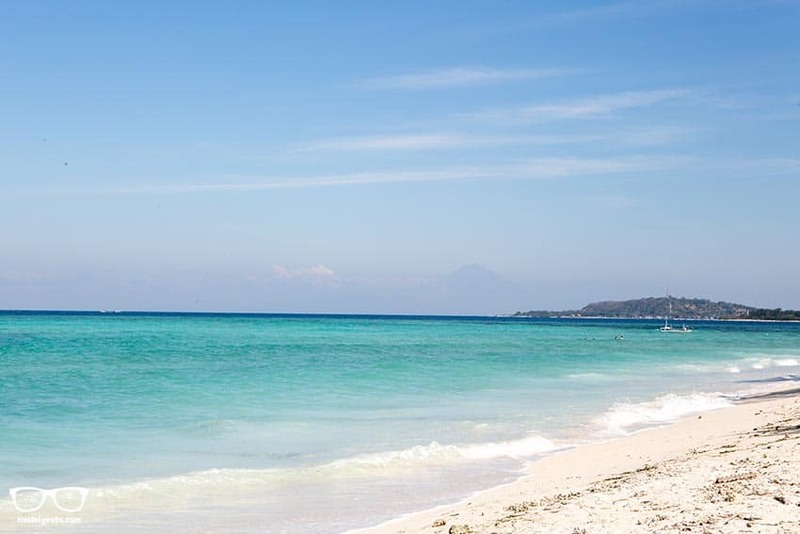 We collected a list of things to do in Gili Air below. 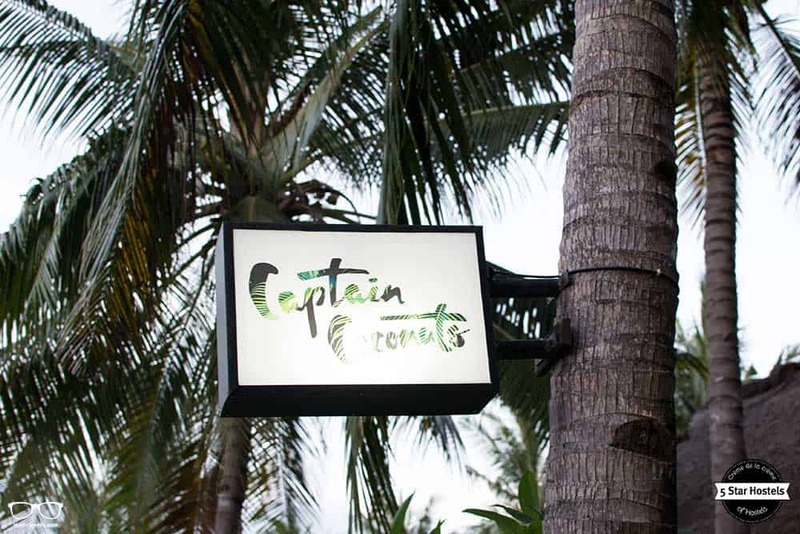 If you are looking for a fabulous tropical hostel in Indonesia by the beach to relax, Captain Coconuts is the place to be. In this review we have a close look on the Captain Coconut, how to get to Gili Air and things to do in Gili Air. 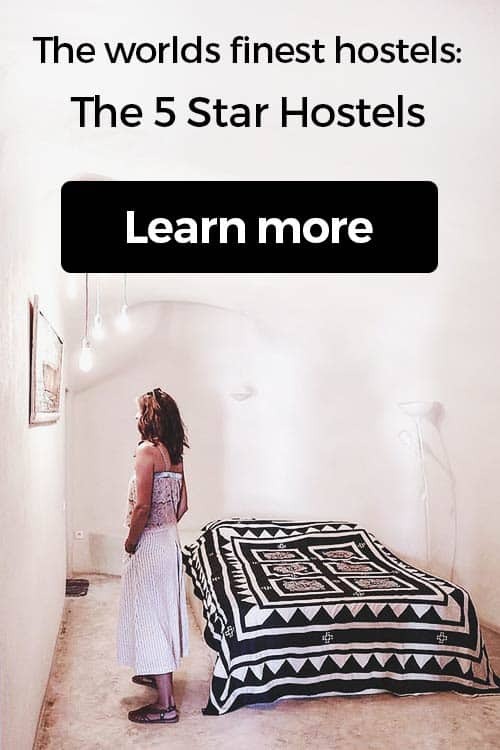 All 5 Star Hostels are awarded by Hostelgeeks, an independent platform designed to deliver the world’s greatest hostels. 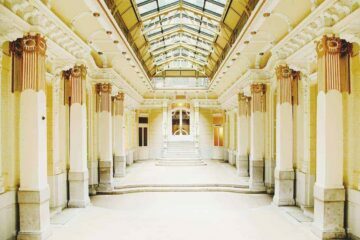 For each destinations we pick the #1 hostel, and share it with you in detail. 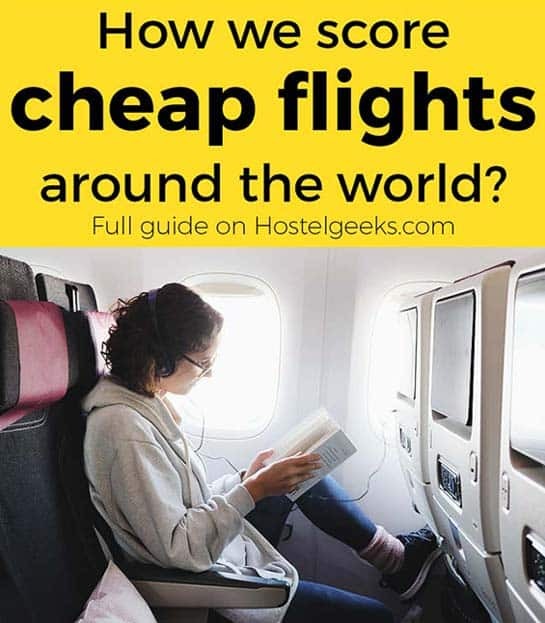 This makes Hostelgeeks your shortcut to the best hostels in the world! 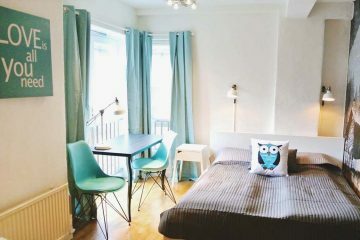 Find here the overview of all the best hostels in Asia. 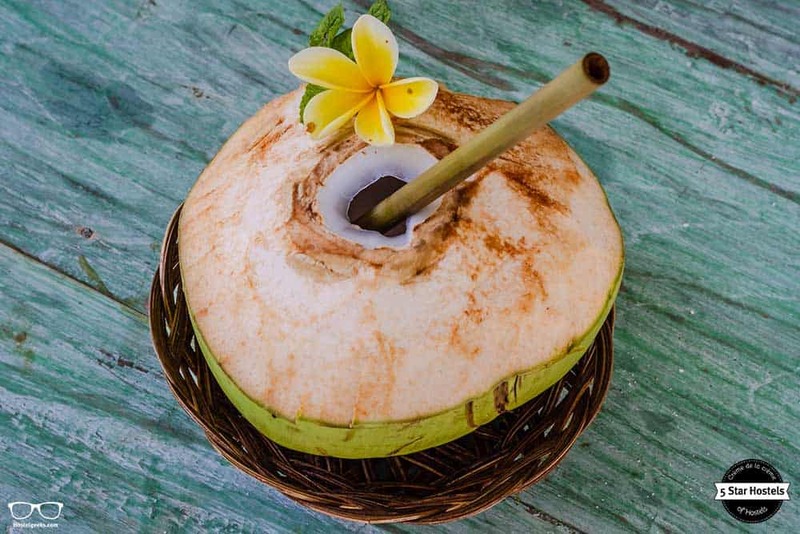 Are you ready for some healthy food, a refreshing coconut in your hand and a dip in the pool? Then follow our footsteps. At Captain Coconuts you will notice a few things that stand out. The major attempt was to keep its natural, earthy and undeniably tropical feeling. 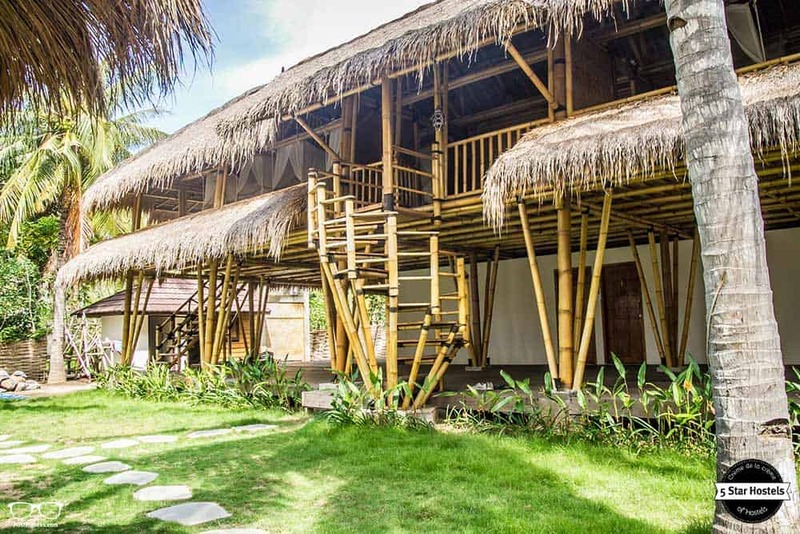 That is exactly why, you will find bamboo buildings and traditional Javanese bungalows. The whole hostel-resort was built around palm trees and plants that already existed in the land. Take some time to relax, and notice also the small details which we love about Captain Coconuts. You will meet a variety of nationalities here. Not a single one stands out. You meet people from Canada, the US, Europeans all over and Australians, Korean and Japan. 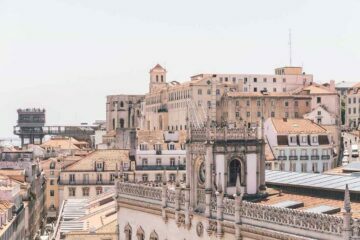 This place is perfect for solo-travelers since it is easy to meet and mingle. Also, for couples it is the best choice on the island. You can enjoy a pool, mingle with more like-minded guests and have your own private bungalow. 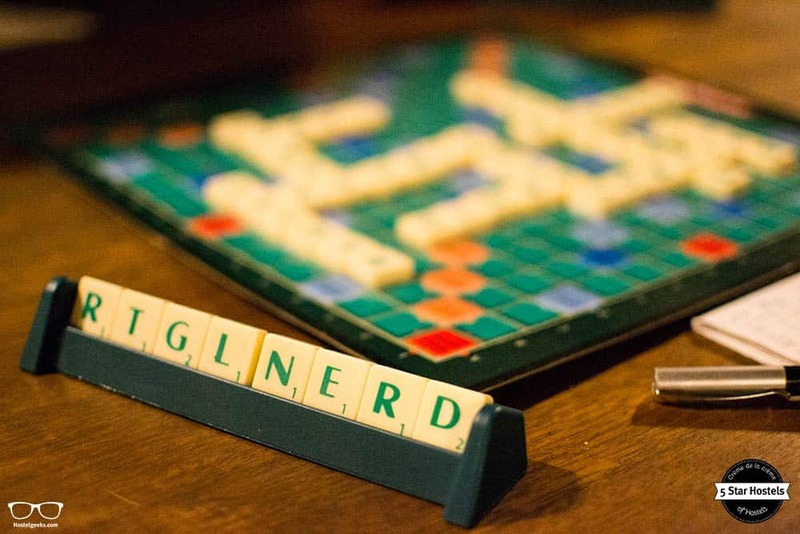 The perks from both sides: private accommodation and the social part! Captain Coconuts Gili Air, is a family owned business. 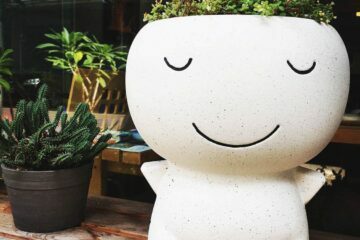 There is lot of thought and love into every detail to create a unique place that fosters connection with the surrounding environment and among the guests. Sustainable, and mindful of its location and environment, born in Indonesia. 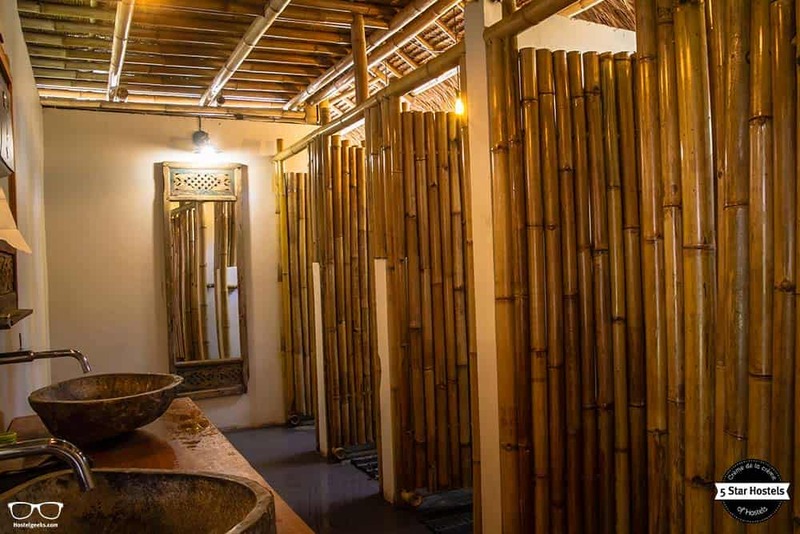 Resa designed the private rooms to the style of the Javanese “Gladak” houses, mixing with practical design. These rooms become cute little tropical homes for weary guests. The colorful carved doors will welcome you to a tastefully decorated interior with light colours. Vintage tiles at the base of the sower and the sink complete the dreamy decoration. 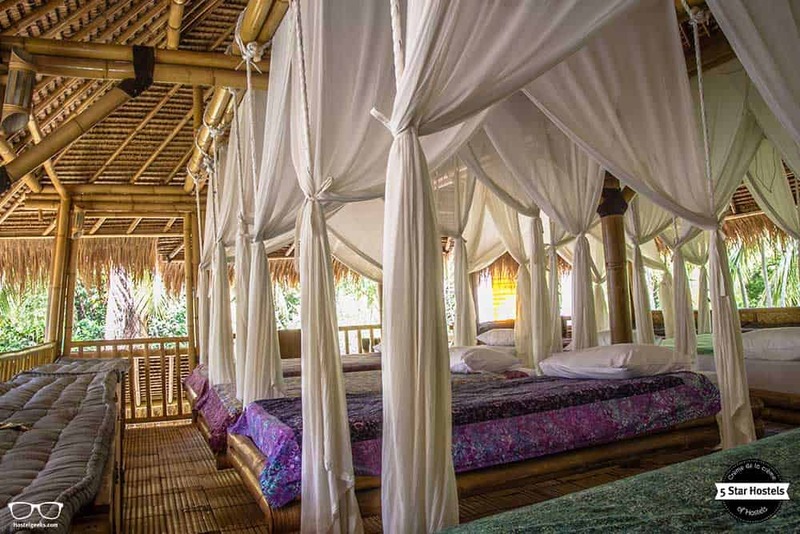 The Bamboo lodge is also designed with the concept of connection in mind, each of the two sleeping quarters has 9 hanging beds. 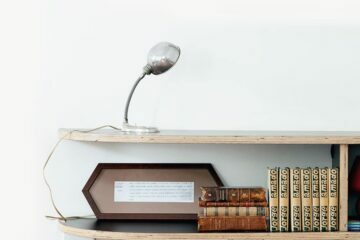 Yes, you read well: Hanging beds! Each bed is suspended from the ceiling. When the tropical breeze drifts in, the breeze rocks you off to sleep with a floating sensation. Some travelers say it is one of the best sleeping experience they had. Worry not about privacy. You are inside a bamboo building with open air sides. Each bed is comes with a mosquito net, as well as a private fan and a locker. The allocated lockers are fitted with charging stations for practical convenience. That way, you can leave your gear charging while you discover the island. 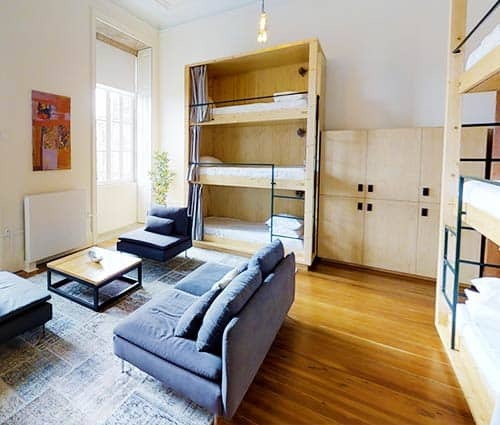 Always use the lockers in any hostel you stay in – we always recommend this. Of course, bring your own padlock. 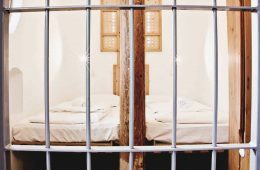 Read: our full article about Safety at hostels. 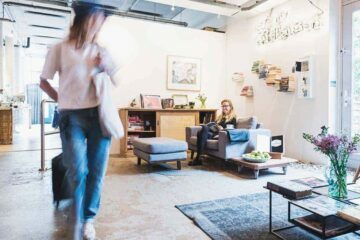 The two store bamboo dorm offers a unique take on shared accommodation. It is open, free flowing design enhances the natural aspect of the concept of connection. The hanging beds suspended from the rafters also offers a new experience for travelers. Captain Coconut also offers delicious whole food meals in their popular café, the menu in has been designed to cater for everyone, with gluten free, dairy free and vegan options available. Refined sugar, palm oil or MSG is not used in any dishes. Guest are treated to a selection of Buckwheat banana pancake, Captains omelette or Apple pie oats included with their stay. This hostel is gonna be awesome! Captain Coconuts offers a relaxing oasis. The resort style feel fosters natural interaction among the guest. The center point of this unique accommodation is undoubtedly the pool and the wooden decked dorm building area that surrounds it. The pool is a great place to soak up the rays, take a refreshing dip, or shelter under the palm trees which grow all over. As mentioned, the bungalows (private rooms) and the bamboo house (dorms) were built around the palms and plants that already existed. A natural tropical feeling is floating all around. Also the in-house restaurant is the center of the interaction between guests and explorers. Games, book exchange, tasty food and refreshing smoothies are a great combination to invite guests to spend hours indulging in their own little slice of luxury on Gili Air. Also, have a look at the Captain Coconuts Instagram. But be careful, it will make your wanderlust explode immediately! We warned you. 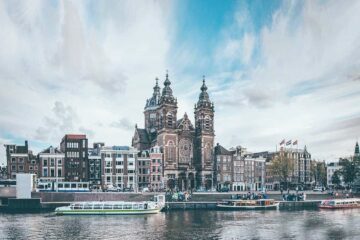 Check out these beautiful hostels through their crispy Instagram filter here. Captain Coconuts commitment to sustainability and the environment is shown through the conceptual planing of the infrastructure. 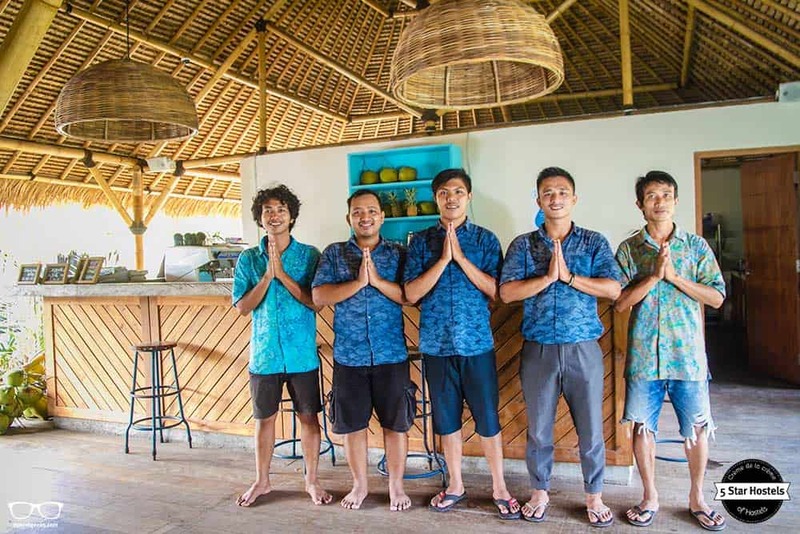 The water is heated by Mother Nature through the use of solar panels and they hope to get all of our power through solar in the near future making Captain Coconuts to be the first ever hostel in Gili Air to be completely of the grid. Bamboo is the primary material for the bamboo lodge, cafe and reception pavilion. That enforces the sustainable ethos. 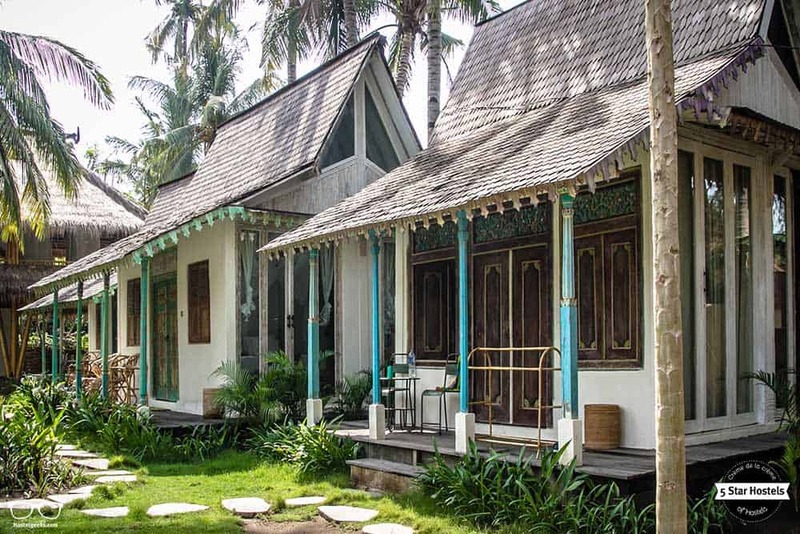 The doors, windows and wood “Gebyok” panels that you see in the villa rooms have been salvaged from old Javanese “Joglo” houses. 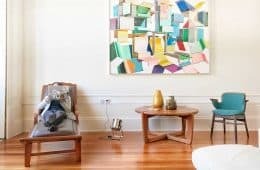 These have been lovingly restored by hand and upcyled to make every room unique connecting us with the Indonesian cultural heritage. 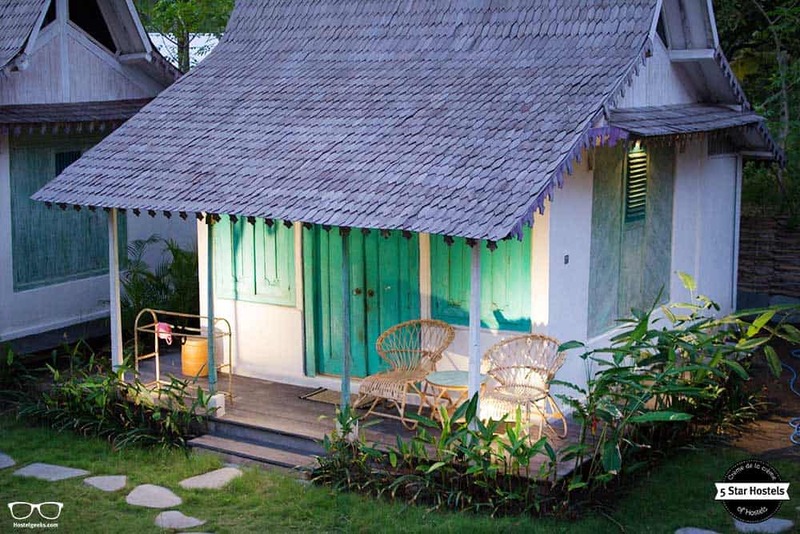 All rooms are positioned carefully to create minimum disturbance to the original coconut trees. There is no plastic policy in the cafe, using bamboo and bio degradable straws, not selling bottled water but instead offering refills. We mention it always. A good staff is what makes guests stay memorable. All staff at Captain Coconuts is local, originally from Lombok. The management trained them to make every guest stay as comfortable and relaxing as possible. Bear in mind cultural differences though: Staff won’t come to “disturb you“. You will have to approach them with any need you might have. The commitment to great service is shown with a high staff rating in various booking platforms. Gili Air: What to do? Gili Islands are well known in Indonesia. Floating in a 50 shades of turquoise sea and fringed by white sand and coconut palm trees, the Gilis are a vision of paradise. No cars, no motorbikes and no worries Islands. And they’re booming like nowhere else in Indonesia. 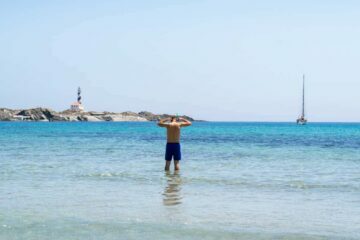 is the largest island. It is the most developed and lively of the three island, also known as the party island. Worry not, eventhough it is very easy to find party, there is also a chilled relaxing area – on the sunset side. the middle island and known as the most quiet island is also known as the romantic escape island. You will find a honeymoon atmosphere all around. the perfect blend of the other two Gilis, known as the chill out island. With a wide selection of restaurants and services, it’s almost as peaceful as Gili Meno. Great for backpackers hiding from the party scene. But going back to the track, what to do in Gili Air? Fun note: We actually learned diving right here on the Gilis. AWESOME experience if you ever want to try. Here you can kick-start your diving-career by diving with turtles, colorful fishes and if you are really lucky, sharks. 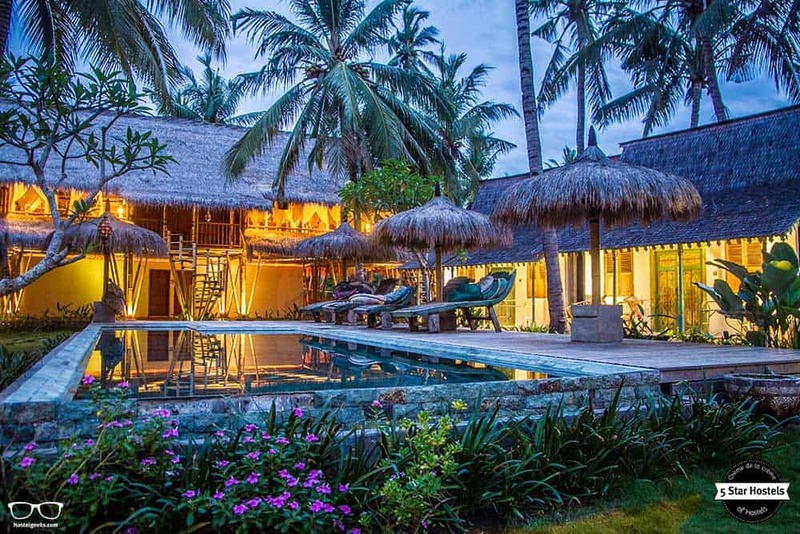 What about the Gili Air nightlife? 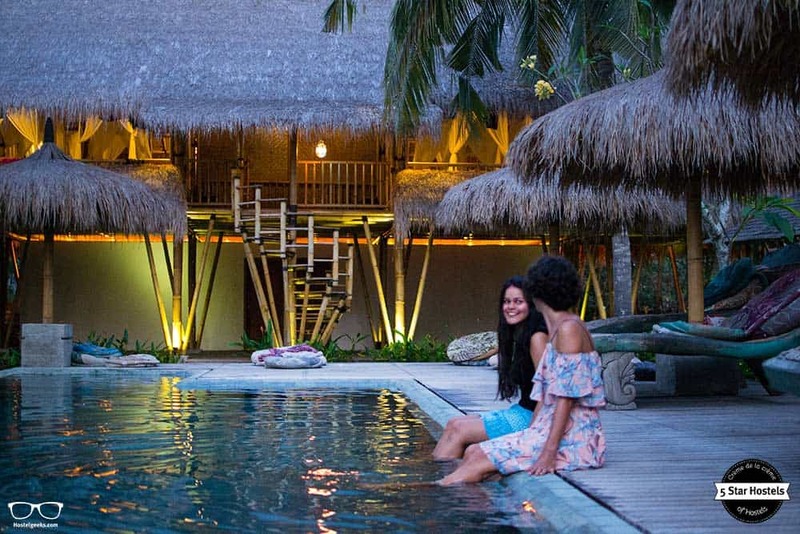 If you are looking for nightlife, it is better if you stay at Gili Trawangan. At Gil Air you will find some live music during sunset time, or even some spontaneous night events like night cinema, but if you wanna party, go to Gili T.
As mentioned, a good thing about Gili Air is that you can find many services. Between them you find restaurants with tasty food and healthy smoothies. Gili bliss Gili Air: good restaurant offering quality and big portions with healthy yet amazingly tasty food. A great place for vegans. 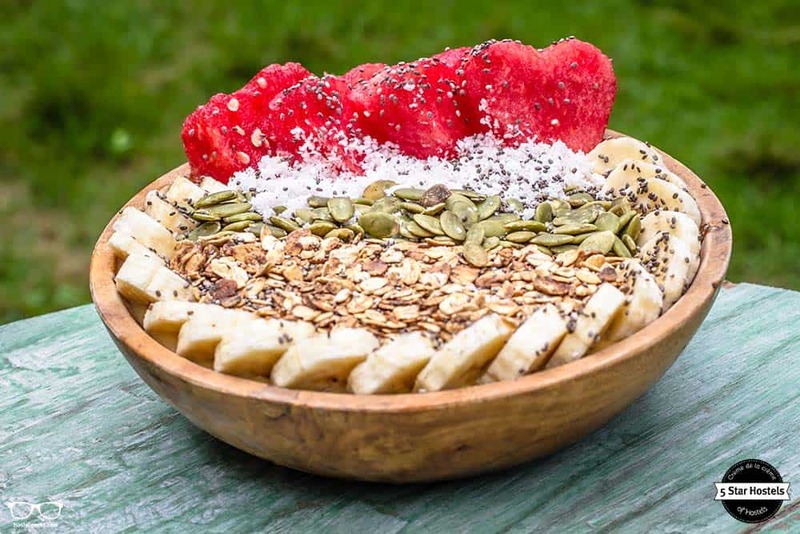 Good earth Cafe: a Café nearby Captain coconuts with tasty smoothie bowls in Gili Air. 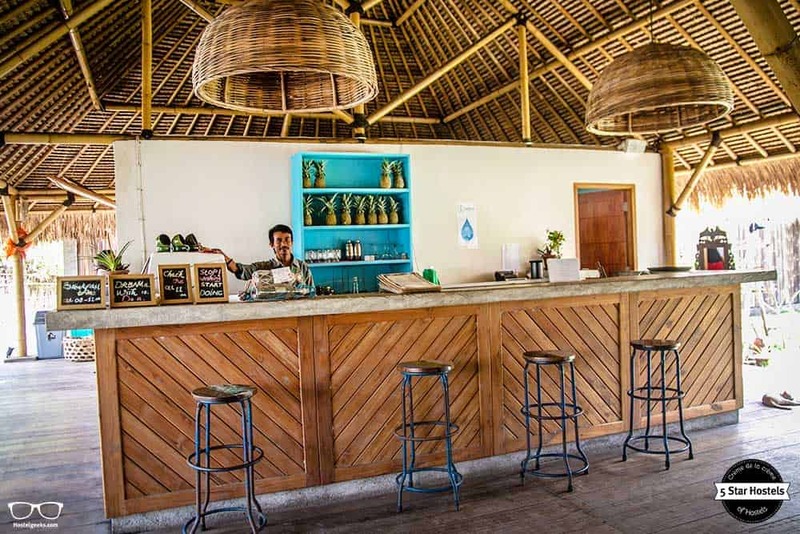 Pachamama Gili Air: this restaurant ranks number one on Tripadvisor. Captain Coconuts: their delicious whole food meals are designed to cater for everyone. They do have gluten free, dairy free and vegan options. Also: refined sugar, palm oil or MSG is not used in any dishes. To get to Gili Air you have different ways. We will explain here how to get to the Gilis from Bali or Lombok. We tried 2 different ways, with speed boat from Bali and with public ferry from Lombok. We took a speed boat from Bali to go to the Gili Islands. A handful of fast boat operators depart from Padang Bai. Lots of them include pick up service in Kuta, Canggu, or even Ubud. You just have to negotiate prices and conditions. Also bear in mind, they will push you to buy return tickets in advance, but we didn’t had any problem buying them once we were on Gili Air. We had a ticket from a tour operator and they came much later than expected for the pick up. Our speed boat departed from Padang Bai around 14:00. Another option is going to Padang Bai and buying the tickets directly at the Boat operator ticket counter. You will just have to get a Taxi to the Padang Bai harbor and avoid all the ticket sellers on the harbor once you are there. Ask other travelers to get better information than locals staying at that area, we found some scams at the Harbor. We also took the local slow ferry from Bangsal Harbor to Gili Air. We arrived at Lombok airport and took a taxi to Bangsal Harbour. It took us around one hour to get to Bangsal Harbor from the airport, as we had to negotiate with the taxi driver for the ride price, stop at an ATM in Mataram (Lombok’s capital) and buy the tickets once we were in Bangsal Harbor. The driver left us at Bunga Bunga Café (marked on the map) and we bought the tickets there. While we were waiting, we ate and drink something at the café. The staff at the Café nicely told us when the boat was ready on the pier. We had to walk around 3 minutes under the sun. On our way to the pier, we discovered we could have bought our tickets at the official ticket counter further on the harbour (also marked on the map). So, that was one of the scams in Indonesia we suffered. Not too bad, as the price difference is less than 0.50$, but good to bear in mind. Buy the tickets at the official counters for the best price. This option will take you more than 8 hours. 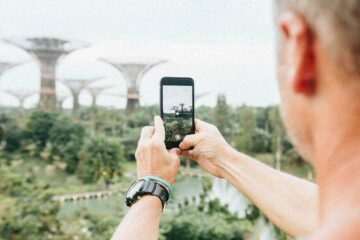 This option will be for the traveler who has more time than money. The local ferry from Padagn Bai to Lombok departs every hour on the hour, and it’s painfully slow. The upside of the (minimum) 5-hour crossing? It is very cheap. Once you arrive to Lombok you will have to take another slow public ferry from Lombok to the Gilis and waiting in between, so the total trip will take over 8 hours. We met 2 couples in Lombok that did it and were not so happy about it. It took them more than 8 hours just to cross from Bali to Lombok. If it’s worth the hassle to you, then go for it. 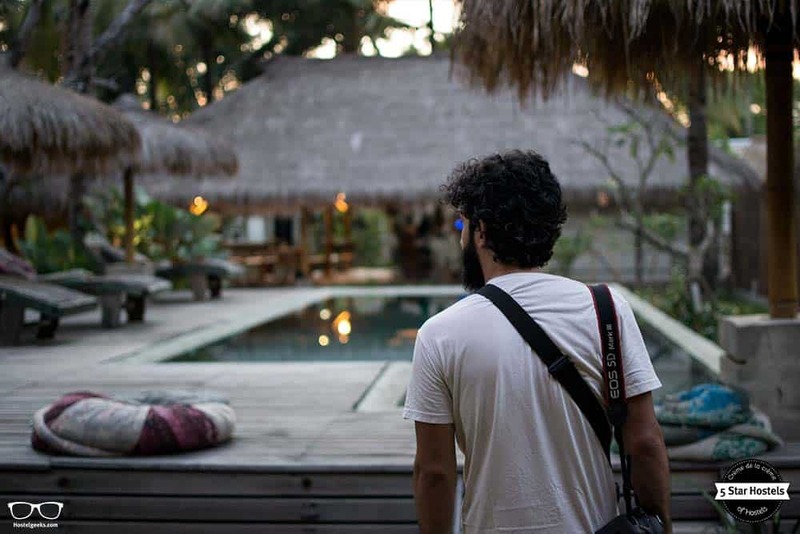 This hostel is an amazing one, located on a gorgeous, tropical island. You can walk around this little island hop into the warm, turquoise-colored water and enjoy an incredible vacation time. Now you know how to get there, where to stay on Gili Air and how to spend your time. Over to you: book your flight and head over! 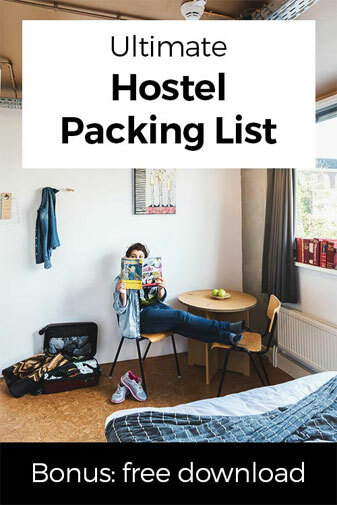 Life is too short to stay in bad hostels! Fancy a promo code for Captain Coconuts Gili Air? Who doesn't?! Now, there is no easy way to say this: Currently we do not have a valid discount for Captain Coconuts Gili Air. 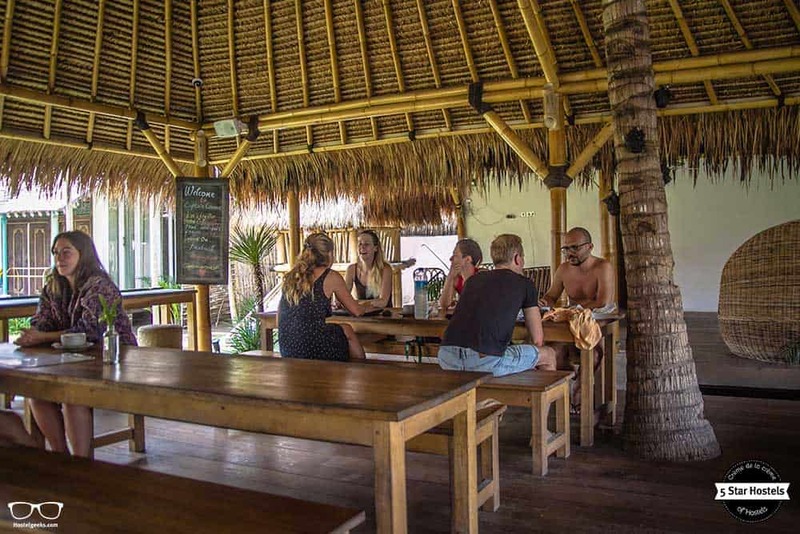 We are working on getting more promotional codes for Captain Coconuts Gili Air in Gili Air, Indonesia and all the other top hostels we reviewed for you. You were looking for the absolute BEST hostels in Gili Air, Indonesia? You just found it! Captain Coconuts Gili Air is the top place we recommend to our friends, family and to you! 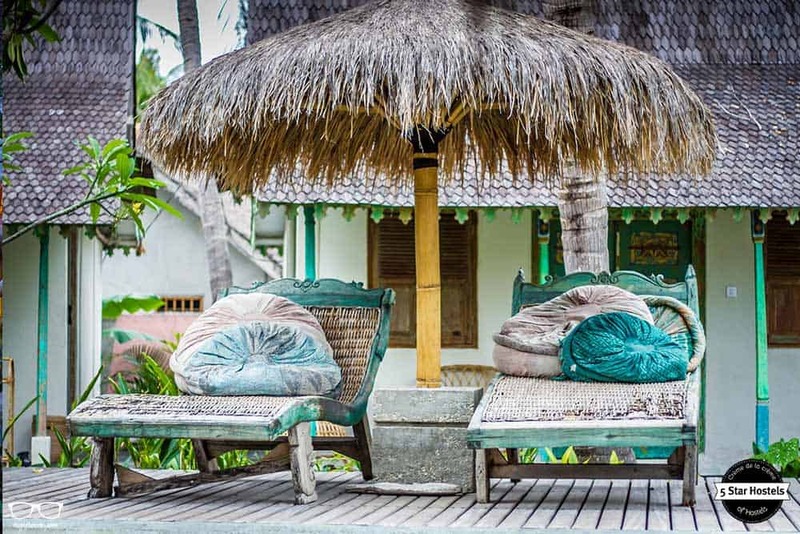 Update April, 2019: How to find flight deals to Gili Air, Indonesia? Still looking for cheap flights to Gili Air, Indonesia? We LOVE Kiwi.com. You can search here with a so-called "radius search". It is incredible easy to find sweet flight deals to Gili Air, Indonesia and area.